There are individuals in this world who have the capability to get people excited and engaged. I’m sure you know a couple. These people are truly living what they were born to do. There are also some individuals who are not just working for a paycheck, but are willing to give all they have to make this world a better place. Hernán Luis y Prado is one of those people. If you’re looking to be inspired yourself, please listen to my interview with Hernán, a U.S. Navy Veteran, who returned home and realized that many of his fellow veterans were not getting proper opportunities in the workforce. Given the skills gap in American manufacturing, Hernán saw a way to address both needs. Hernán shares his very passionate story about how he risked his own career to help veterans gain the skills they needed to re-enter the workforce by starting the workforce development program Workshops for Warriors. Workshops for Warriors is an organization that not only trains our veterans to fill that skills gap, but in the process is also the changing the lives of veterans. Hernán also has a very positive story about how to get moving to start making our world a better place. Instead of giving away any more details, take a few minutes to hear Hernán tell his inspiring story, as I cannot compete with his passion. I encourage you to donate to Workshops for Warriors at wfw.org, where 87 percent of donations go straight to training veterans. I was at work late one day, and this gal came to me and said, Hey, can I have some money? So what do you mean? So I need money. I said, Well, don’t we all need money? Because I’ve got two kids that I haven’t seen. I said, All right, are you a veteran, and she said, I am okay. And fast forward. Four months later, she said, You know, when I met you that day, I was probably at the lowest point of my life. But when I walked through the doors of workshops for warriors, I found hope again. And you gave me that hope you gave me hope to believe in myself and to work again. And now she’s making $27 an hour. She’s in a house for the first time in five years. And most importantly, she was reunited with their two kids that are both less than 10. That’s great tip of real life impact that we have over here. Hi there. This is a solid works born in design podcast, a podcast of inspiring stories about those who create build inventing engineer new ideas into actual new products. And by the way, they all use solid works. I’m your host Cliff meddling, and this episode is titled veterans designing their future. Today I’ll be speaking with US Navy veteran Hernán Luis y Prado. After returning home, you’re not realized many of his fellow veterans, we’re not getting proper opportunities in the workforce, given the skills gap in American manufacturing or non so a chance to address both needs. Hernán shares is very passionate story about how he risked his own career to help veterans gain the skills they needed. Let’s jump in and hear the amazing journey of workshops for warriors. So how did workshops for warriors get started? So that was 2003, 2003 or so I came back from Iraq. And I was stationed at the Naval Observatory, where the Vice President of the United States lives and works. So I would go back as part of my duties to different hospitals and see that more and more of my friends were being stuck in hospitals. And they had nowhere to go. Literally, they were waiting for physical therapy, or a prosthetic or some type of something before they were able to go back to where their family was. Normally in California. So these were primarily West Coast Marines that were stuck in the East Coast. And they had no timeline, literally, every week, the doctor would and say, next week, you’re going home, son, next week, then 2-3-4, 20 weeks would go by. And the guys would still be at that hospital. And Marines deal with a lot of different things were very, very well, but they don’t deal with uncertainty very well. And I started seeing them in my travels at the hospital. And they started recognizing me, and they say, Hey, Doc, you know, what are you doing here, and I explained what I was doing, and invite them over to my house, and they just come out and hang out. And before you knew it, I had a whole garage full of Marines that were in my, in my house, or my garage. And they were just blowing off steam and just trying to figure out when they were to get back. But I realized there was something that needed to be done, but it didn’t really understand what I could do a because I was so busy. And the because I thought, well, so many smarter, more capable people with more resources than I have tried to deal with this issue. And they haven’t succeeded. I’m just gonna let someone else take care of it. And despite that, I’d see people come every day at the hospital mangled up in fact, I was trying to go to medical school. So I would volunteer at the hospital at night. And I was working under one of the orthopedic surgeons there. And he helped me He gave me a lot of experience. So I was in the hospital emergency room. And we were doing simple procedures, to doing amputations for some of the guys that were coming back. And every day I noticed that more and more people were coming back with less and less limbs and their future seem to be growing bleecker and bleecker. And then again, I couldn’t quite wrap my head around what it is that needed to be done, or how I could help do anything. And I told my wife now girlfriend at the time and said, you know, Rachel will get a do something. She said yeah, I agree. And she’s a survey methodology as a statistician and a very, very sharp person. And she said, You know what, you’re right. We should figure out what is we could do. That’s it. I I agree. I agree. But I guess couldn’t devote the brainpower to it that it needed. And then one day and late 2004, early 2005, I’m in Montgomery mall, this, this voice comes out of nowhere and says, Doc, Doc, and I turn around and I see this guy john Jones that does calling out to me and coming towards me. And he says, Doc, I need you to be my best man this Friday at noon. Okay, called Get up and give me a hug. I haven’t seen this guy in two years, as we were in Iraq together to get up and goes, Oh, I can’t. So what do you mean as well, after you left me in Iraq, I stepped in a double stack IUD. And I lost both my legs. And it was such a powerful shock for me to see this one guy, this guy that I’d run through 29 palms with Cruise up and down the home because our river we’ve done so many things but to see him and knowing that we would not be able to do all of the things that we did before. And I pulled myself together. And I said, Yeah, yeah, I’ll be there on I’ll be there on Friday. Don’t worry, john. And he turned around you and he wheeled away and I literally sank to my knees. And I thought to myself, if, if this is John, this is a guy that I know that I spent some time with an I could just see his whole future shattered all of his dreams has aspirations and everything that he had planned on, just got demolished. And he didn’t see that that moment. But I did. And as I’m sinking down to the ground, I literally grabbed my wife elbow, when I said, we’re going to sell everything we have, and we’re going to do something. And my wife to her eternal credit said, Yes, we are. That’s how we started workshops for warriors. And how did you know it was they needed jobs, they needed training. What brought that idea upon? And then all of a sudden, you’re just ripped out of this fabric and just cast asunder. And it’s an incredibly difficult situation to be in, particularly if you’re young and your whole ego is built around how fast you can run, how well you can shoot how many pushups you can do. So when you’re in the service, people are constantly telling you how valued you are, how much the American population loves you how you can get a job doing no matter what, how you’re a leader of men, how you can innovate and adapt and overcome. But it’s hard to go out in the real world as a scout sniper or as a commando and say I like to be a welder or a machinist or a fabricator or anything in polite society. If you think about it, most people love veterans, but what they need are welders, machinists, Computer Aided designers, Computer Aided manufacturers, people that can get it done. So what we’ve done and workshops is basically created this intersection between two Venn diagrams of all the great skill sets that an honorably discharged service member would bring to the fight. So that’s a great communicator metric driven, enthusiastic optimistic, honest drug free, timely, and then we give them compressed nationally recognized credentials and skill sets that are important to America’s manufacturing base. For example SOLIDWORKS certified SOLIDWORKS associate credentials are offered here certified SOLIDWORKS professional credentials are offered here. We teach master cam computer to manufacturing. American Welding Society welding credentials. We teach three, four and five x is turning and milling as well as NC three credentials and National Institute for metalworking skills. credentials. 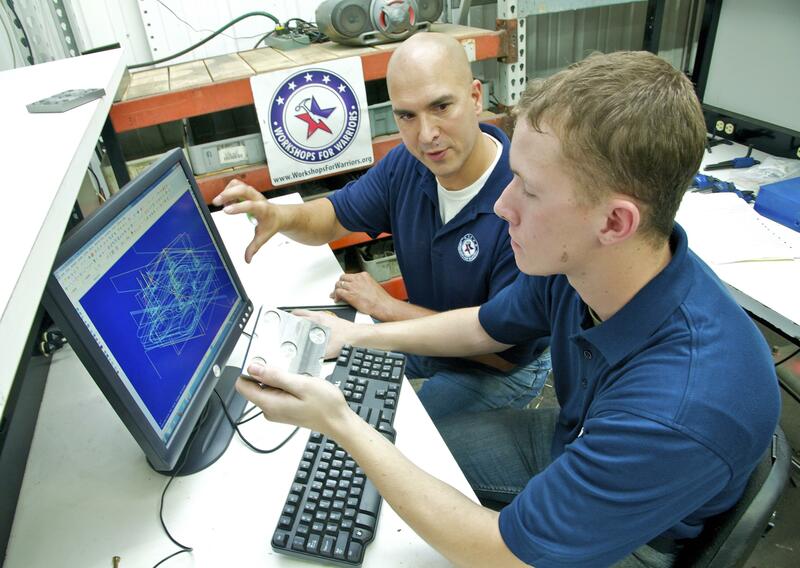 Our motto is we train, provide nationally recognized training and credentials and place veterans into advanced manufacturing careers throughout America. That’s great. Now now for scale. How many students have gone through there? And I’d love for you to also talk about, you know, your placement ratings. So we started workshops for warriors in 2008, our first class in San Diego was 2011, and it had two people in it. Then in 2012 or 13, we were up to four to five people for class. And now we’re running at 60 students per class three times a year with 532 graduates of our program that have earned over 3520 nationally recognized credentials. And a 94% placement rate for all of our graduates since 2011. But we’ve been really fortunate. One is we’ve got great subject matter, right. So we’ve got the best prime material you can work with, which is service member of the United States military, and then they they normally come to us anywhere from six months to two months before they leave active duty service. So we train veterans wounded warriors and transitioning service members. The transitioning service members can be up to six months before they leave active duty. Right. Could you share maybe one or two you have, you must have some favorite stories about some of the students that have come through. I we have a lot. Fortunately, we’ve got 532 great stories. One of the biggest challenges here is how to communicate these great stories like let me give you one thing that really galvanized me at the very beginning was I was at work late one day, and this gal came to me and said, Hey, can I have some money? So what do you mean? So Well, I need money. I said, Well, don’t we all. I need money because I’ve got two kids that I haven’t seen. I said, All right, well, are you better? And she said, I am okay. So I brought her upstairs. And fast forward. Four months later, she said, You know, when I met you that day, I was probably at the lowest point of my life. But when I walked through the doors of workshops for warriors, I found hope again. And you gave me that hope. And you gave me hope to believe in myself and to work again. And now she’s making $27 an hour. She’s in a house for the first time in five years. And most importantly, she was reunited with her two kids that are both less than 10. Its a real life impact that we have over here. That’s great. That’s that’s, you know, as they talk about an emotional paycheck, that must be great. You’re changing lives. So we spend our money, our time and our talent on training. In fact, 87% of every dollar given to us go straight to training. And this is while we’re expanding training and course offerings while we’re providing more and more wraparound services to our students. And that’s only because of the team that we have. That’s That’s excellent. Which brings up another question, you know, what are your future plans where, where’s what’s the what’s next for workshops for warriors? Well, we’ve been asked by President Obama and President Trump’s team to expand to 103 schools throughout the nation. Which I love the idea. However, I’m a pretty practical person. So I’m more interested in the funding of how that would happen, though. In short, we’re planning on staying here in San Diego until we build out our $50 million capital expansion plan, which will enable us to train and graduate over 1400 veterans wounded warriors and transitioning service members per year in San Diego. And once that facility is built out in the next two to five years, depending on funding, then we will have built by that time a train the trainer program, and then those trainers will then go and man up the other six hub facilities that we’re going to be opening throughout the United States. And then once those right capacity will go downstream and continue to build up the other locations. Crrect earlier if we get more funding, so it’s just a matter of open your wallet? There’s no big deal Cliff. Yeah, exactly. Well, it was speaking is no, speaking of which, you know, how can others help? Where can they find you? Obviously, you know, we’ll do a weekend we’re going to promote this blog, but what can others to to help? Where can they find you? How can they participate?. And how you can help. I would say two things. One is you can reach out to the companies that you work in and see if they do a matching grant or challenge grants or come by and visit us. Literally, every time we do a tour here. People leave and say, Oh, my God H, I wish I had come earlier. I wish you had impressed upon me the need to come earlier because now I can I’ll tell my friends. I’ll tell my boss, I’ll tell my broker. I’ll tell everyone about workshops for warriors. I’ve never been in a more impactful place, in fact, cabinet member. So Linda McMahon, who’s the administrator for the Small Business Administration came by and said that she’s visited 39 states and over 7000 companies and organizations and we were the most impressive facility she had ever been to and that our training programs should be replicated and should be the model for advanced manufacturing training throughout America. Oh, absolutely. I mean, there’s, there’s such a need to fill that skills gap, as we hear so much about today. So there’s definitely need I don’t see any limit to where you guys can grow. That’s great. I think they’re important things that Americans need to kind of realize and internalize. One is that we’re not kids anymore, we need to put our shoulder to the grindstone and help our nation out. And this is one of those times. So the spigot for advanced manufacturing for this nation was turned off, roughly 10 years or so after world war two ended. And yet this nation has coasted by on a series this in fact, this huge infrastructure for advanced manufacturing that the Department of Defense created in order to support our work time efforts. And then these subject matter experts were either in the service or out of the service. And then they retired from the service. They were hired by industry industry then perform the same type of job and we had on the job training led by these subject matter experts. And then the apprentices for the subject matter experts now are retiring as well and there’s no one left to take their spot. So right now, if you think that that we’re we’re doing well, I would ask you to think about some pretty frightening statistics, which is 2013 Department of Labor put out a report stating that the median age of your advanced manufacturing worker was 59 years old. And there were 2.3 million advanced manufacturing jobs that were unfilled due to lack of skilled labor. And that number was expected to rise to 3.5 million in the next five years. So this silver tsunami is a pool of available employees for advanced manufacturing that is getting smaller and smaller and older and older, with no training pipeline, other than workshops for warriors available to help generate the talent that is required to keep this nation at the top of the advanced manufacturing heap, and also to start innovating new and environmentally sound ways of either producing or innovating new products. And you’re able to invent because you need something. And because you’re exposed to different things that you are trying to make better if we don’t put the best tools, technology and software in the hands of our nation’s veterans, and give them an opportunity to really saturate themselves with that knowledge and practice and come up with a hard way of doing things over and over until they say, you know what, there’s a better way and I’m going to patent it, this is going to become a US patent, and this is going to help our nation we are not going to succeed. Secondly, from a defense standpoint, given our paucity of advanced manufacturing employees, and that in 15 years, most of these people will be retired. If we go to war, and our shipping lanes are cut. Our nation currently does not have the means to rebuild herself. And we are going to stop that. And workshops for warriors is committed to rebuilding America’s advanced manufacturing workforce with veterans, and we need your help. And we need everyone to stop thinking, Oh, this is a good idea. I’m going to go back home, I’m going to go play Plants vs. Zombies, and think this is important to our nation, to our future, and to our children. And I’m going to contribute money. I’m going to see how they can help. And I’m going to see what doors I can open for them. That’s what we need people to do. We had one of our students go through a program and he had lost his leg in Iraq. And he came in one evening, he said, Hey, H, I need to borrow one of your meals at night. But my first thought always want a marine nasty to borrow a mill late at night, is that they’re going to build a gun. So I said, Well, tell me what you’re going to do. And he said, Well, it’s taking me four to five months to go into the VA to get seen for new prosthetics. And if I can just change the angle on my foot right now, I’d be able to use this leg. But right now, I can’t use it. And I am getting tired of walking around on corrections. So I said, Tell you what, I’ll put the lead instructor on this for you. You tell them what you need. And we’ll build you this new prosthetic ankle. And we came up with this ankle. And we submitted it for patenting. And now this guy with the skills that he learned in our school was able to literally get back on his feet. And less than a week, when the VA told him it would be four to five months. That’s the skills that we can put throughout our nation. And that was done on SOLIDWORKS with software that was donated to us on equipment that was donated to us on tooling that was donated to us in a building. The lady said, we’ve never sold the building before, but we’re going to sell it to you because we believe in what you’re doing. So I’m saying every American has the opportunity today to think, am I going to do something impactful, or am I not. And these are all things that happened because somebody decided that today they were going to do something impactful. And that’s what we can do for our nation. I couldn’t agree more. That’s a great story. Hernan this is great. Your passion about this project is excellent. You know, I think we you bring up a great point. And we do need to start thinking about the future of American manufacturing. And we all it’s important to all of us, right? I think you made that point very clear. And it’s true. Well, thank you so much for your time. today. There’s just so much good information from what you mentioned, a very impactful. That’s what you need. Like, we need to really start thinking about an apprenticeship program in the US again, and have that be something that is subsidized, just like our roadways or shipyards. If we really want to create a pool of people that can rebuild our nation that can rebuild our infrastructure and make it a future based infrastructure and not a backwards leaning infrastructure. We need to have people that are armed with the best skills, technology and software possible. And that requires money and it requires patience on everyone’s end. That’s a good point, is it? It’s happening, right? And so we knew that we were going to be demolishing several buildings that it made no sense to build a big half a million dollars to half a million dollar classroom only to demolish it they year so we built these classrooms out of shipping containers and we designed them in SOLIDWORKS we cut out the pieces using model lasers of flow water jet some hospitals and lays are welder fabricators put it together and this thing looks amazing. In fact, Department of Defense came over and said Wow, we should use these things for homeless shelters and DARPA and FEMA. And so this is something that literally necessity was the mother of invention. And this is something that we’d like to really infect every veteran that leaves a service and how to rebuild our nation. And I want every American to really galvanize themselves around the idea that together we can do so much more than if we were divided. Thanks for listening today. And remember, if you’re interested in helping out our returning veterans, please do I encourage you to go and check out workshops for warriors at WFW.org. That’s WFW.org in which 80% of donations go straight to training veterans. We will be back again soon with more great born to design podcast stories at SOLIDWORKS.com/podcasts or wherever podcasts are readily available. Until then, keep innovating.